There's a fine line bewteen genius and madness. Lockslyn always strives to straddle that line and have a foot firmly planted on both sides! 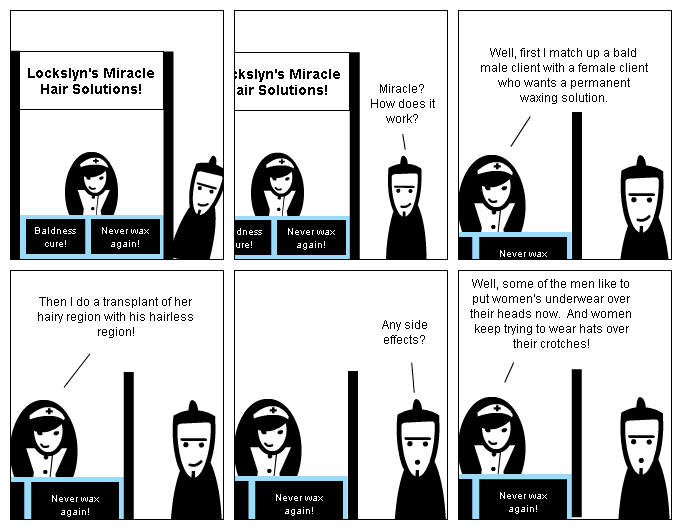 Lockslyn's Miracle Hair Solutions! Baldness cure! double click to write... Never wax again! Lockslyn's Miracle Hair Solutions! Baldness cure! Never wax again! Miracle? How does it work? Baldness cure! Never wax again! Well, first I match up a bald male client with a female client who wants a permanent waxing solution. Baldness cure! Never wax again! Then I do a transplant of her hairy region with his hairless region! Baldness cure! Never wax again! Baldness cure! Never wax again! Any side effects? Well, some of the men like to put women's underwear over their heads now. And women keep trying to wear hats over their crotches! is this what happened to SnakeY?